Manchester, N.H., Jun 22, 2017 / 09:05 am (CNA).- Chiara Corbella Petrillo lived a short life. She met her husband Enrico Petrillo at age 18, became the mother of three children, and died at the age 28. But what happened within those 10 years has touched the hearts of thousands across the globe. Chiara’s sainthood cause was opened last week, five years after her death. Her story is told in the 2015 book, “Chiara Corbella Petrillo: A Witness to Joy,” published by Sophia Institute Press. “In the story of the Petrillo couple, many people recognize a providential consolation from heaven,” said Simone Troisi and Christiana Paccini, close friends of the Petrillo’s who wrote the biography of Chiara’s life. “They discover that in any situation, there is no real reason to be sad. This is because Chiara shows that if you have God as your guide, misfortunes do not exist,” they told CNA. Chiara and Enrico married in Italy on September 21, 2008 after having met at Medjugorje in 2002. During the early years of their marriage, the young Italian couple faced many hardships together, including the death of two children, who both died only 30 minutes after birth. Chiara became pregnant a third time with their son, Francesco. However, the joyful news of their pregnancy also came with a fatal diagnosis of cancer for Chiara. Her cancer was an unusual lesion of the tongue, which was later discovered to be a carcinoma. Chiara rejected any treatment that could have saved her life during pregnancy because it would have risked the life of her unborn son. As the cancer progressed, it became difficult for Chiara to speak and see clearly, eventually making her final days on earth particularly excruciating. “Her [Chiara’s] suffering became a holy place because it was the place where she encountered God,” Troisi and Paccini recalled. Although many couples face hardships, Troisi and Paccini remembered something different about the Petrillos – they leaned on God’s grace which made their family particularly serene. They made peace with the reality that Chiara would never grow old with Enrico or watch Francesco grow up. Chiara died on June 13, 2012 at home in her wedding gown, surrounded by her family and friends. Although her earthly life was over, Chiara would continue to be a witness to joy. Troisi and Paccini believe that Chiara’s legacy is still living on because she gave witness to the truth that “love exists.” Neither she nor Enrico were afraid of love, marriage, or of committing themselves to their family. Chiara and Enrico’s remarkable story is “a story of salvation in which God shows himself as a faithful God: they trust in Him and are not disappointed,” they stated. However, they were quick to note that Chiara was not “an extraordinary young woman, in a way that makes her different from us.” Rather, she struggled with many human fears and anxieties, especially with thoughts of pain, vomiting, and purgatory. With Chiara, the ordinary always became the extraordinary. Troisi and Paccini have fond memories of everyday life with the Petrillos, when a conversation about cooking chicken would end in talking about heaven. “We would share simple things like dinner, chatting, games on the rug with little Francesco… always very simple, without masks,” they remembered. Chiara has been called “a saint for our times.” Although her death was only five years ago, her legacy lives on and has inspired others around the world to be the same witness to joy. “Today, this joy is visible in those that lived alongside her: even if they miss her, they experience a mysterious and profound joy,” Troisi and Paccini stated. An earlier version of this article was originally published on CNA Dec. 2, 2015. Washington D.C., Oct 18, 2018 / 05:00 pm (CNA).- New data shows that an increasing number of babies worldwide are born to unmarried parents. Washington D.C., Oct 26, 2017 / 03:01 pm (CNA).- A pro-marriage student group at Georgetown University has drawn support from prominent Catholic scholars, after a student petition accused the group of promoting intolerance. Love Saxa is a pro-marriage student group at Georgetown, which faces an Oct. 30 hearing before the Student Activities Commission, an advisory body to the university’s Vice President of Student Affairs. Fr. 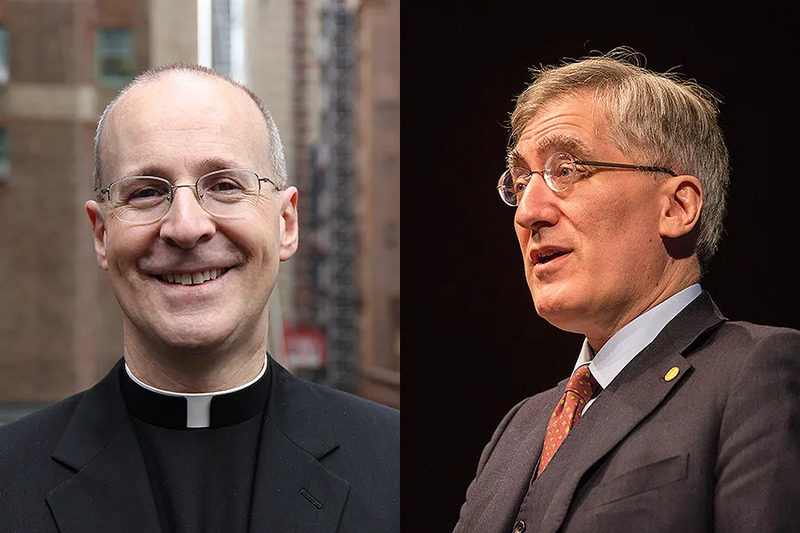 James Martin, SJ, author of “Building a Bridge,” a book on dialogue between the Catholic Church and LGBT groups, said that he supports the right of “Love Saxa,” to promote its views at Georgetown. Robert P. George, a professor of constitutional law at Princeton University and noted scholar of marriage and religious liberty, also voiced support for Love Saxa. “The illiberal – even authoritarian – spirit infusing the effort to defund Love Saxa at Georgetown ought to be a matter of grave concern for honorable people across the ideological spectrum,” he said. If Love Saxa is found to be in violation of university standards, as the student petition alleges, the commission could recommend that the university impose sanctions, including a loss of funding and access to university facilities. A spokesperson for Georgetown University told CNA that such sanctions are only used as a last resort, and that groups in violation of university standards are first given opportunities to rectify violations. “We strongly support a climate that continues to provide students with new and deeper contexts for engaging with our Catholic tradition and identity. Love Saxa is one of many groups operating on campus with positions that affirm the teachings of the Catholic Church. We also support a climate that is welcoming to all students and supporting of our LGBTQ communities,” the spokesperson added. Martin also encouraged respectful dialogue, rather than conflict, at Georgetown. George also called for respectful conversation on the matter. “The sheer, brute, undeniable fact is that reasonable people of goodwill disagree today about fundamental questions having to do with the nature and social purposes of marriage and with sexuality and sexual morality,” he said. Miami, Fla., Apr 18, 2019 / 05:16 pm (CNA).- The Archdiocese of Miami is warning Catholics against a spate of fake priests who are scamming parishioners for money and gift cards, supposedly for good causes. Lent is over. Now what?